Last week I visited a local yarn shop (Knitters Niche on Southport) and, with help from the shopkeeper Mary Ann and my friend Diane, picked out some yarn for a new project. Here is a picture of it. The darker blue (which is a bit slatey in real life) was a hand-me-down from my friend Linda. It is a vintage superwash wool. I have ten skeins of it. The light blue and green were thought by all to spark up the dull, though pretty, darker blue. The lighter yarns are Cascade 220, also superwash. I bought 2 balls of each. The project I had in mind for this yarn turned out to be ill-advised, ill-conceived, and a crappy idea. 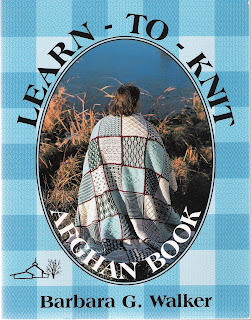 So with a mind full of seventies lore, what do I reach for but the Learn to Knit Afghan book by Barbara G. Walker? This is a 1997 reprint of the seventies classic published by Schoolhouse Press. Like I really need another project. But I have always been fascinated with this afghan, and the heart does not listen to the head. There were four major factors that played into this decision. I had most of the colors. 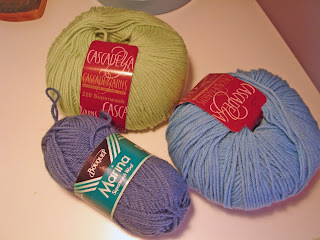 But I had to buy one more color (dark purple, on its way) and more of the light blue and green. The original idea was to save money since I had the dark blue already. I ended up spending a fortune. 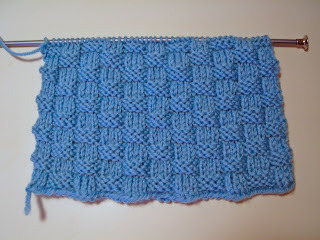 I love projects that are in squares or other units, because you can get a sense of completion over and over again. The biggest factor: I saw two real life examples of this afghan made by Diane and they were beautiful, much more so than the picture on the cover. There are some extreme beauties on the Ravelry page as well. As usual, I like the ones made of many uncoordinated colors less and the coordinated ones more. Props to the Scarlet Knitter for her beautiful coordinated version which is used to illustrate the project. So there you have it. I figure this can be a long term project with a square made every now and then. Of course I have been neglecting everything else the last day or two to knit squares. The one below is already finished and another one started. I've always been a fool for basketweave. What a neat afghan! I liked the coordinated color versions I saw on Ravelry too, although the one-color neutrals were pretty nifty also. Oh hec, I want that book now!